Making a presentation to colleagues, management, or customers is a critically important moment in our working lives. Because we are on show when we are presenting. We are being judged... as people rather than as information-delivering-machines. So, when you make a presentation, your message – what you are aiming to get across – is the second thing that people respond to. Back in 1967 Albert Mehrabian published research which suggested that in communicating just 7% of the impact is the result of what we say and 93% is the result of how we look and sound. These figures are much-quoted in the world of NLP, in communication skills' workshops and even in Wikipedia as a way of emphasising the importance of non-verbal communication. But they are highly questionable (see our body-language article). How any one person responds to another person is likely to be based on a lot more factors than can be accurately measured in a research project. That said, Mehrabian's formula does underline the importance of how we look and sound over when getting our message across. It's not what you say – it's the way that you say it! Have thoroughly researched and organised their information. This appears to be true for people at all levels within organisations, from senior management to frontline staff. They stand in front of the group, open their mouths and immediately begin to lose credibility and sabotage their message... by their style and their preparation of their material. Being unable to confidently handle questions of awkward situations. There is truth in the old maxim: 'people buy people first - and then they buy their products, services, or ideas'. If people don't like the messenger they will often reject the message. For example, many of us have had the experience of going into a shop to buy something that was in stock - only to walk out without buying and spend time searching for another store simply because of the disinterested, patronising or aggressive style of the salesperson. Whether we are delivering a formal presentation, or contributing in a workplace meeting, how we come across has a huge bearing on whether or not our ideas will be given a fair chance. And our verbal and non-verbal style has a huge impact on how people evaluate us. We can get away with perhaps one or two of the distracting habits or mannerisms from the above list – but more than that and we may be jeopardising our standing in the organisation. One of the NLP fundamental principles is 'the meaning of your communication is the response you get'. In plain English this means that the effectiveness of your communication can be gauged by how your audience responds to you. It's the opposite of the quite common 'well I told them - what more can I do!' approach and suggests that if we want to move hearts and minds then we need to do a lot more than just talk at people. The following are six ways in which you can self assess how you present or how you speak in meetings. Take the topics one at a time and tweak your style based on how each presentation or session is received and responded to. When speaking with a group ensure do you give everyone sustained rather than fleeting eye contact? With very large audiences you give this sustained eye contact to small sections of the audience. Incidentally, this type of eye contact is one of the best ways of increasing your own confidence. Do you allow the audience to read and absorb the slide information? Remember that most people in your audience can read! You don't need to read each slide out for them. Remain silent and allow them to read what's on the screen - only resume speaking when they re-establish eye contact with you. Do you rush through the presentation in an attempt to 'get it over with'? Rapid, rushing, and breathless delivery is a sign of nervousness. Do you allow people to think about your points? This is very closely related to the previous one on 'pace'. 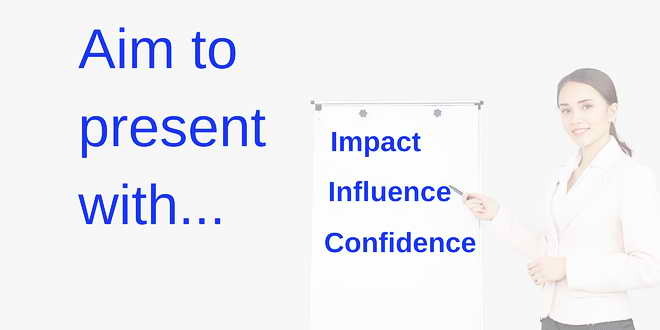 Confident speakers use pauses for impact and to enable listeners to process what is being said. Auditory Tonal: Mid-range with lots of variety of sound – mid chest breathing. Auditory Digital: somewhat clipped and in some circles considered 'authoritative' because of the edginess of the tonality. None of these is 'right'. The ideal is to have the ability to use all four in your presentation since this will match the thinking styles of different people at different times. Working on the above list will go a long way towards increasing your impact. And it can be useful to recruit an ally in this process since few of us are aware of our and vocal and physical mannerisms. Ask your ally to pay attention to how you come across in meetings and presentations. Reassure them that you will really be open to their frank and honest feedback! To keep things manageable, and palatable, ask your ally to give you feedback on just two or three of the above points per session. And ask them to also tell you what they liked about your presentation. We are none of us immune to sincere compliments!